Now I always do my best to dress up in red, white and blue for the 4th, but I have to say that, in general, there really isn’t much to find around here. There are a few options where you can go to have some “real American food”, like the Hard Rock Cafe (http://www.hardrock.com/cafes/madrid/) or Alfredo’s Barbacoa (http://www.alfredos-barbacoa.es), but don’t expect anything fancy or close to fireworks. 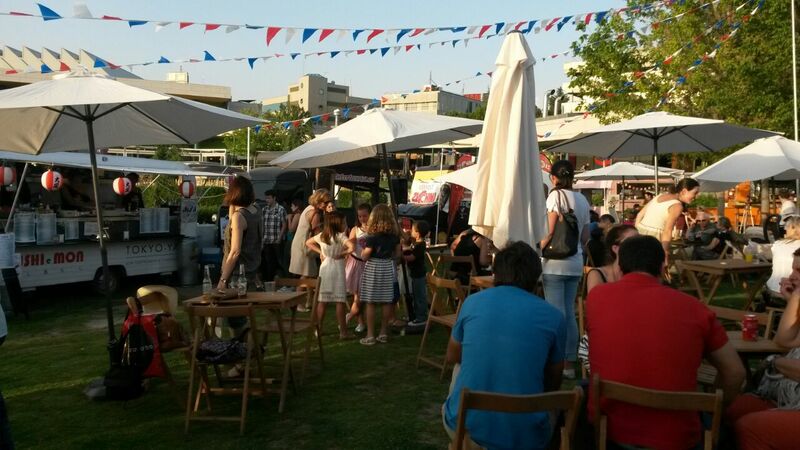 This year there was a new addition to the American July 4th offerings in Madrid: an “American Street Food Festival” at a posh shopping center (http://moralejagreen.com/agenda/american-food-truck-en-moraleja-green/). This event was promising an array of American-style food trucks that have been popular in the US and recently made their way over to Spain (note: it’s interesting that when I was still living and working in the US ten years ago, food trucks were considered a bit of a risky lunchtime bet). I went with an American friend yesterday and was surprised to find that the promised “sabores americanos” (American tastes) were a mix of about ten trucks with foreign food offerings – Mexican tacos, Spanish croquetas, Japanese food, etc. There was one hot dog truck, but as it turns out they were actually German. Oops. Well, at least the idea was interesting and there were American flags up around the place. 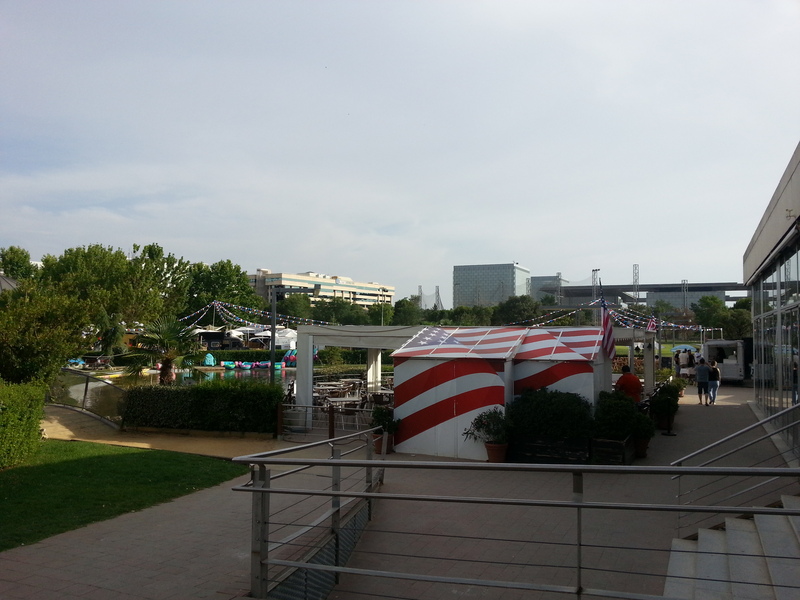 Apparently there’s another food truck festival on Sundays near the Santiago Bernabeu football stadium (http://madridnofilter.com/madreat-street-food-revolution-begins-madrid/); this seems like a better option, flags or not. 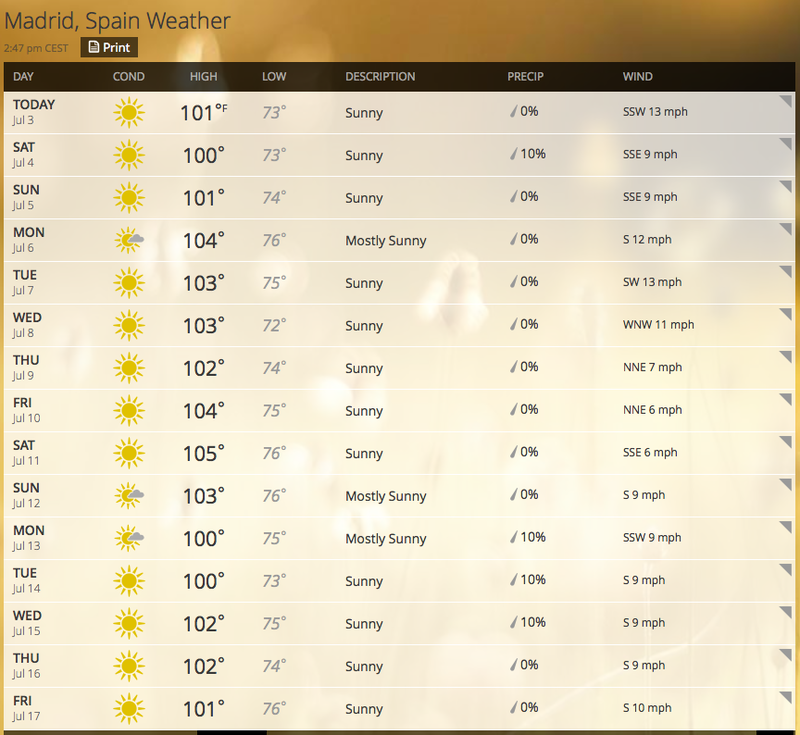 Next year I’ll still put on my red, white and blue at least for part of the day, but it’s looking like the fourth here in Spain is better for all colors of the rainbow. At least I’d be guaranteed a better celebration! This entry was posted in Miscellaneous on July 6, 2015 by Michelle.